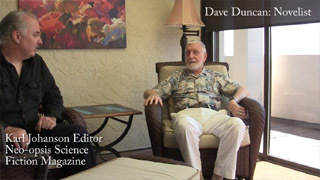 Canadian fantasy and science fiction writer Dave Duncan died on October 29, 2018. 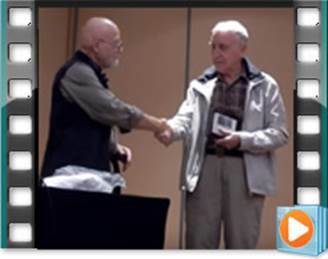 Dr. Robert Runté made a presentation at Dave’s memorial, at Windsor Park Pavilion, Oak Bay (Victoria), BC, Canada, on February 2, 2019. 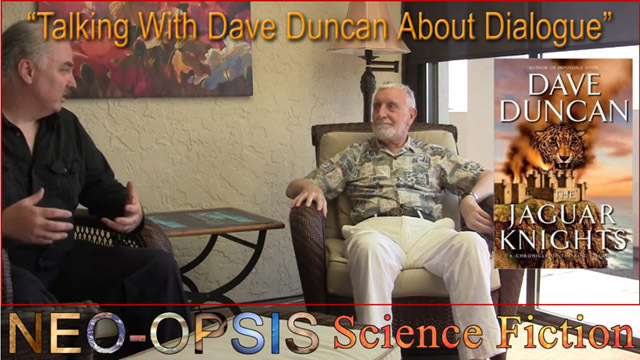 Following this is an excerpt of an interview Karl Johanson did with Dave Duncan in 2015. 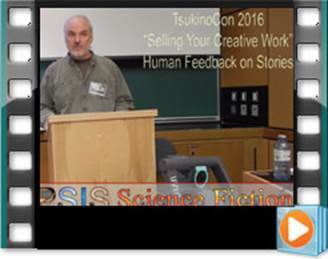 Excerpt from the panel "Selling Your Creative Works," Tsukino Con, UVic, at Tsukino Con, Feb, 2016. 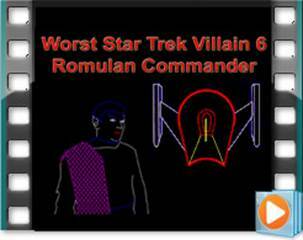 Fans of Babylon 5 will appreciate this 10 second clip. Sunset Point, Cox Bay, Tofino, BC, Canada. September 2018. Worst Star Trek Villain Part 7. 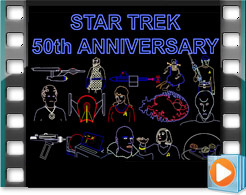 This video series examines various adversaries in Star Trek and compares them to Khan (from the episode "Space Seed," and the movie Star Trek: The Wrath of Khan") who is claimed in the movie Star Trek: Into Darkness to be "the most dangerous adversary the Enterprise ever faced." 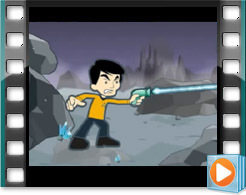 This video compares Khan to the Roger Corby and the android Ruk, from the episode, "What are Little Girls Made of?" 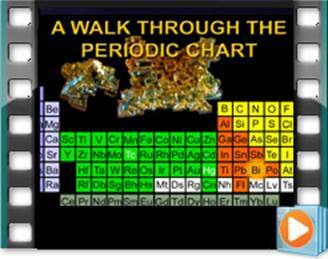 The Periodic Chart done with movie and TV Clips. 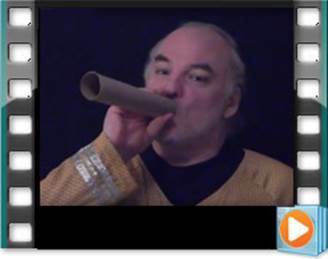 Karl tries to get through the original Star Trek theme. Part 4 of the panel "Whats Going to Happen in the Future?" 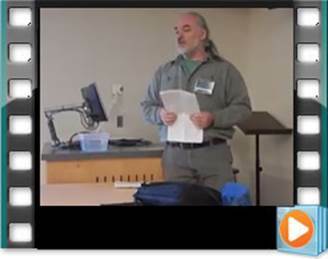 "Can We Stop Genetically Modified Organisms?," at Tsukino Con 2017, at the University of Victoria, Feb 18, 2017. Part 3 of the panel "Whats Going to Happen in the Future?" 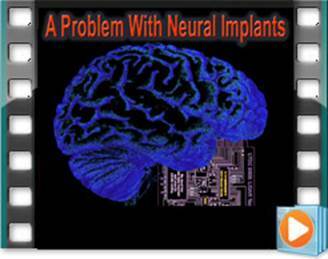 "A Problem With Neural Implants," at Tsukino Con 2017, at the University of Victoria, Feb 18, 2017. Part 2 of the panel "Whats Going to Happen in the Future?" 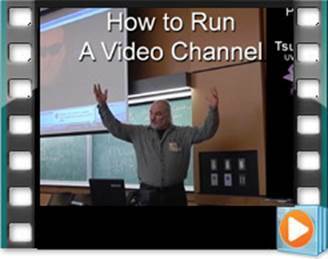 "The Great Fizzle Before the Singularity," at Tsukino Con 2017, at the University of Victoria, Feb 18, 2017. Part 1 of the panel "Whats Going to Happen in the Future?" 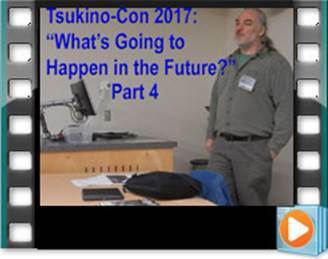 "The Decline of Future Shock," at Tsukino Con 2017, at the University of Victoria, Feb 17, 2017. 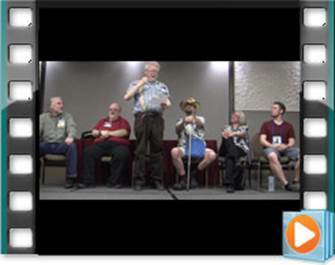 VCon 2016 panel discussion “Nonverbal Communications. Aviva Bel’Harold, Claire mcCague, Karl Johanson, Stephanie Johanson. 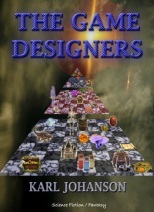 "Do we include the nonverbal language of aliens and humans in our writing, shows, movies, and games? "Power poses... fake it until you become it." Panelists discuss the value of nonverbal language in storytelling." Most of the discussion was about how aliens might communicate. 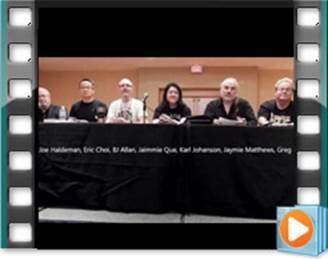 VCon 2016 panel discussion "Are Games Art? Roger Ebert set off an internet storm when he suggested that, unlike movies, video games were not art, and never would be. 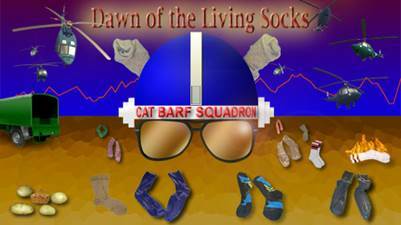 Are video games art? If not, will they ever be?" Panelists Joe Fulgham, Carlos Lozano-Gilabert, Isaiah Sweigard, Lynda Williams, Eric Chu, Karl Johanson, and Stephanie Johanson. 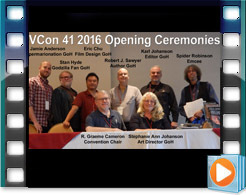 Information on VCon is available at vcon.ca. 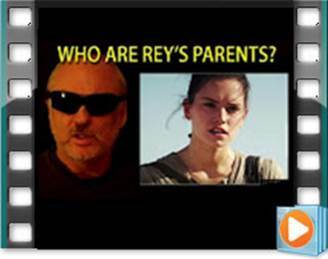 There's lots of conjectures about who Rey's parents are in the movie Star Wars: The Force Awakens. I'm adding a few conjectures to the mix. 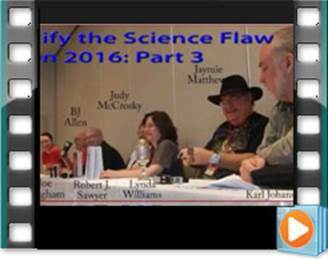 6th annual Justify the Science Flaw Panel: Part 2. With Joe Fulgham, BJ Allan, Robert J. Sawyer, Judy McCrosky, Lynda Williams, Jaymie Matthews, Karl Johanson. 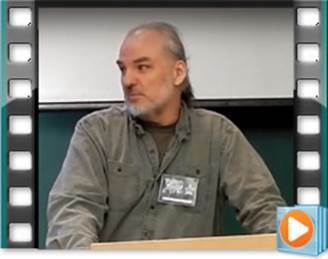 Presented at VCon 41 in Surrey (Vancouver), BC, October 2, 2016. 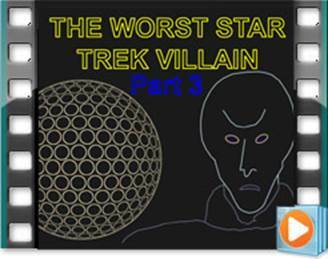 This part deals with flaws from super hero stories, Star Trek, Star Wars, and Alien. 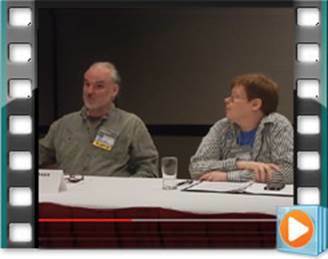 VCon 41 panel: "How'd that get on my Cover? Join the Art Show Director and several Authors, Editors and Publishers (including the Author, Editor, and Art Director GoHs) as they discuss how cover art is chosen, what the artists are told, and which parts of the book are used for inspiration (if any)." Panelists Robert J. Sawye, Karl Johanson, Stephanie Johanson, Rita Schulz, and Russ Crossley. VCon 2016 Opening Ceremonies. 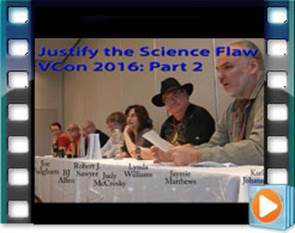 VCon is a science fiction convention in Vancouver BC, which has been running since 1971 (vcon.ca). With Jamie Anderson, Stan Hyde, Eric Chu, Robert J. Sawyer, Karl Johanson, Spider Robinson, R. Greame Cameron, and Stephanie Johanson. 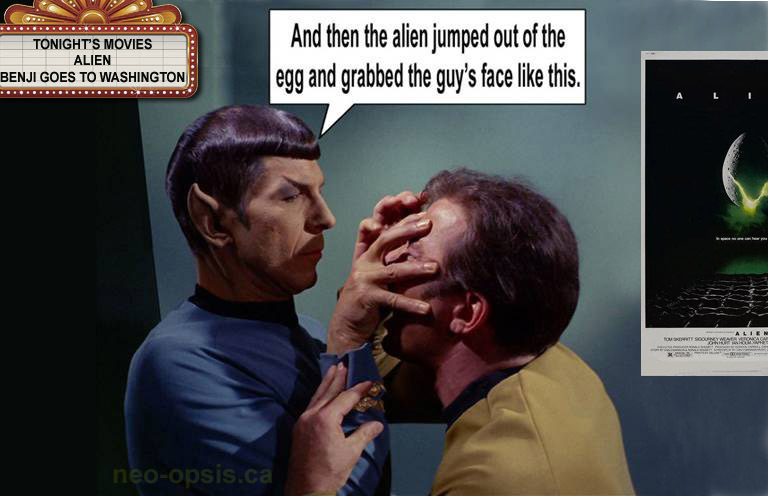 The first episode of Star Trek to be aired, "The Man Trap," was first played on September 6, 1966 in Canada. 2 day later it was played in the US. 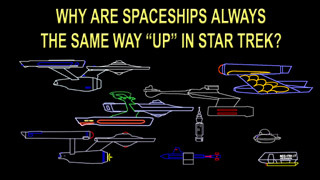 This video briefly discusses ways in which people were inspired by Star Trek. 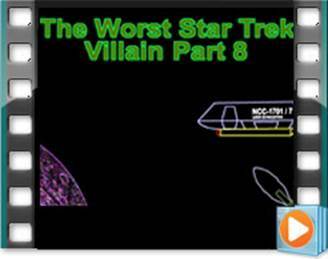 Who was the worst villain in the classic Star Trek series? 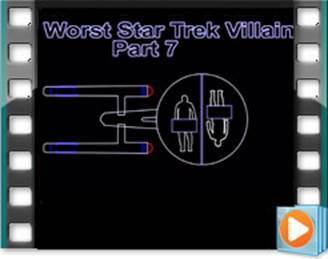 This video series examines various adversaries in Star Trek and compares them to Khan (from the episode "Space Seed," and the movie Star Trek: The Wrath of Khan") who is claimed in the movie Star Trek: Into Darkness to be "the most dangerous adversary the Enterprise ever faced." This video compares Khan to the Romulan Commander in the episode, "Balance of Terror." 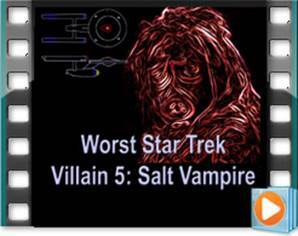 This video compares Khan to the Salt Vampire from the episode, "The Man Trap." 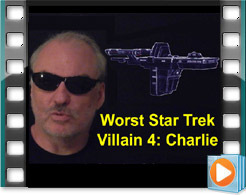 This video compares Khan to Charlie from the episode, "Charlie X." Writer Peter David tells a story about a sudden increase in numbers of women at Worldcon (World Science Fiction Convention). A few pointers on writing in this excerpt from the panel, "So You Wanna Write," at GottaCon 2012. -Joanna Gaskell: Webseries (Standard Action). -Eric Seaton: Tabletop RPGs (Crosstime Games). Pitching short stories, versus pitching comics or computer games. Neo-opsis editor Karl Johanson and Laurie Smith. 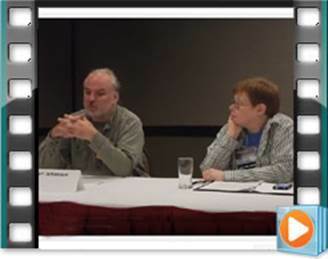 Another excerpt from the panel, "How to Pitch to an Editor," at KeycCon 33, in Winnipeg, MB. May 21st, 2016. Neo-opsis editor Karl Johanson and Laurie Smith. 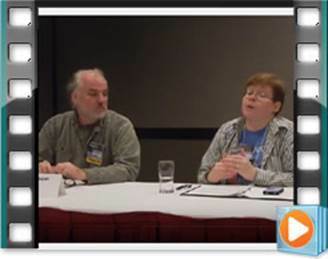 An excerpt from the panel, "How to Pitch to an Editor," at KeycCon 33, in Winnipeg, MN. May 21st, 2016. 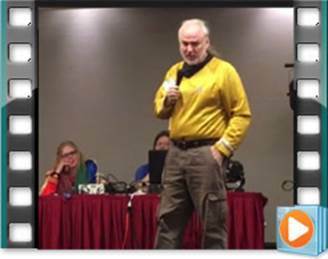 I was the editor guest of honour at the science fiction convention Keycon, in Winnipeg, Manitoba. I and the 2 other masquerade judges needed some time to work out all the numbers from our sheets judging all of the costumes and performances, so I entertained the audience briefly. 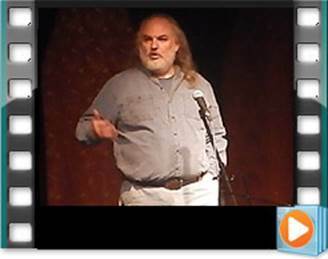 An excerpt from the panel "The End of the World," at Conversion Con 2006 in Calgary, Alberta. This section is a brief comment about the weight unfounded opinion is too often given. Panelists left to right: Jeff Krehmer, Larry Niven, William Gibson, Karl Johanson and Scott Barker. 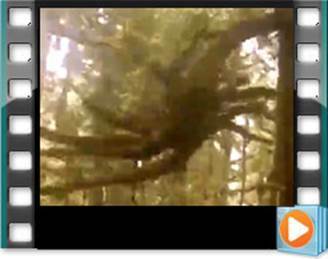 Video recorded by Jeff Krehmer. This isn't to say that science is always right, as humans do science and humans have biases and make mistakes. It's just that science is a process intended to try to work around bias and error. 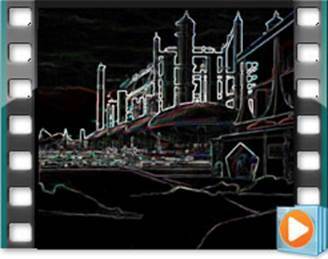 Keycon is a science fiction convention held yearly in Winnipeg, Manitoba. (Keycon.org) From left to right, Karl Johanson (editor Guest), Peter David (writer guest), John Mansfield (convention chair), John Speelman (convention chair), Julie Czerneda (writer guest), and Justin Currie (artist guest). 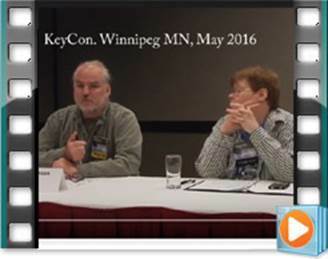 Keycon 33 was held on May 20, 2016. 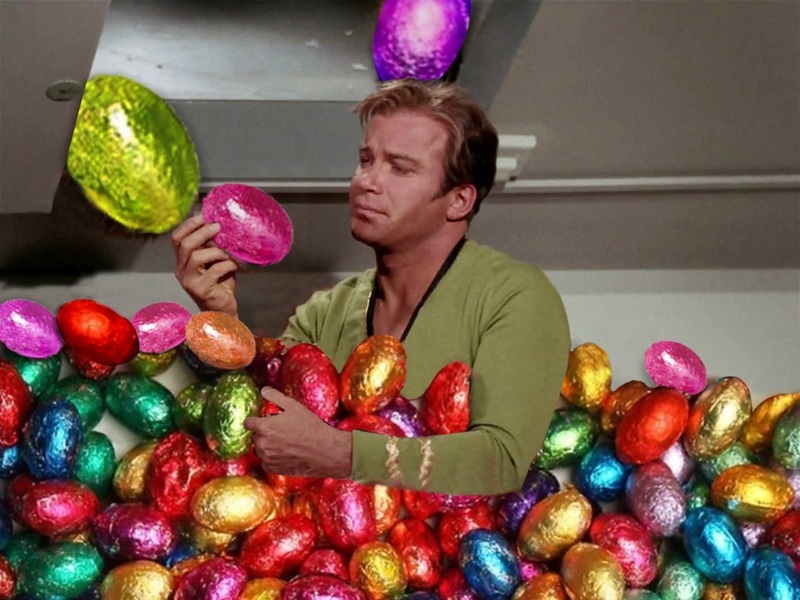 "Where No Man has Gone Before." 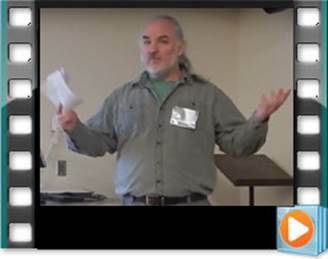 An excerpt from my presentation "Selling Your Creative Work” at Tsukino Con at the University of Victoria. Feb 13, 2016. The full panel description was, " "Selling Your Creative Works. Gets some pointers on selling art, writing and other creative works, from a person who buys works as an editor and who sells works as a freelancer." 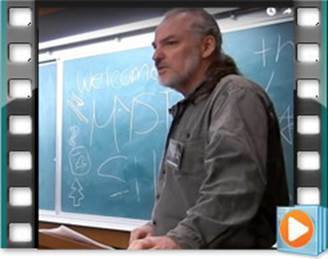 An excerpt from my presentation "Unintended Consequences," at Tsukino Con at the University of Victoria. Feb 13, 2016. The full panel description was: “Unintended Consequences: Sometimes scientific, technological or social changes have unintended consequences. Science fiction sometimes predicts or recognizes such unintended consequences. Here’s an opportunity to hear some thoughts on the topic by a science fiction magazine writer / editor." If you enjoy Neo-opsis, please consider nominating it, or any of the stories or artists featured in Neo-opsis. 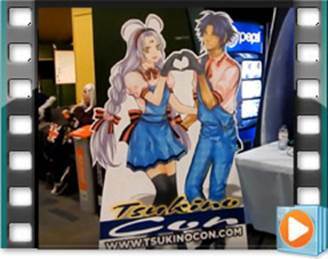 Tsukino Con is an Anime convention which has run for several years, at the University of Victoria, in Victoria, BC, Canada. I did a brief walk around video of part of the the convention on Friday night, before my panel on "Selling Your Creative Works." 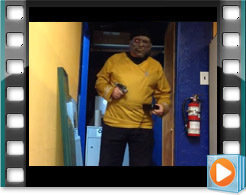 As seen in the video, a major feature of the convention is a great deal of very creative costuming. 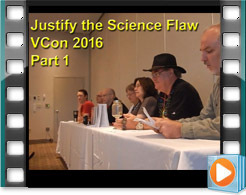 This is the 5th annual VCon (www.vcon.ca) "Justify the Science Flaw" panel. 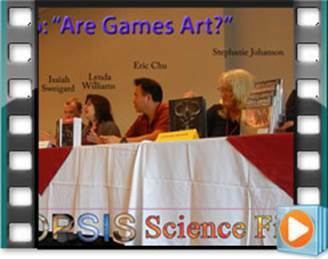 I bring up science or technical flaws from movies or other stories, and a panel of scientists and science fiction authors either explain how it's not actually a flaw if you look at it from the right perspective, or they come up with some plausible sounding handwavium which could allow the audience to suspend disbelief. 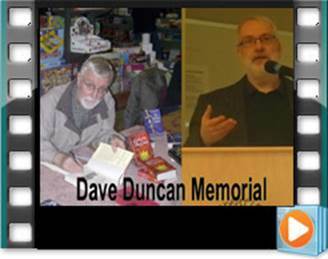 The Canadian Science Fiction and Fantasy Association presented author Dave Duncan with a Lifetime Achievement Award, on October 4, 2015, at the convention VCon 40 in Vancouver BC. 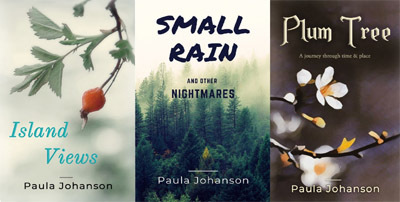 Information on the Canadian Science Fiction and Fantasy Association , which also runs the Aurora Awards, is available at: www.prixaurorawards.ca. 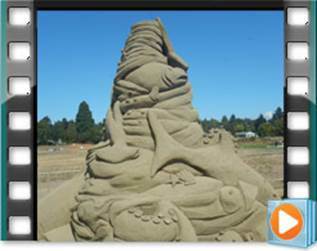 Sand artist Fred Dobbs and a team of 7 others made these sand sculptures at Gyro Park, next to Cadboro Bay, Saanich (Victoria), BC, Canada. (If anyone knows the names of the other artists, please post it here. The sculptures featured Minions from Despicable Me, a seal or sea lion, a large sharknado (from the movies of the same name), a pelican and a shark from Finding Nemo, and a lighthouse. 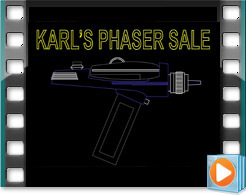 The ultimate party trick involving a phaser! Impress your friends! Impress your relatives! Impress Dave! 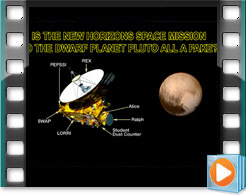 Is The Mission to Pluto a Fake? The The New Horizons deep space probe to Pluto was launched on January 19, 2006, and will flyby on July 15, 2015. But is the entire mission a fake? Was it all done with modern computer generated special effects? Has NASA been fooling us all? Did the rocket that allegedly launched New Horizons actually launch a secret military neutron cannon? 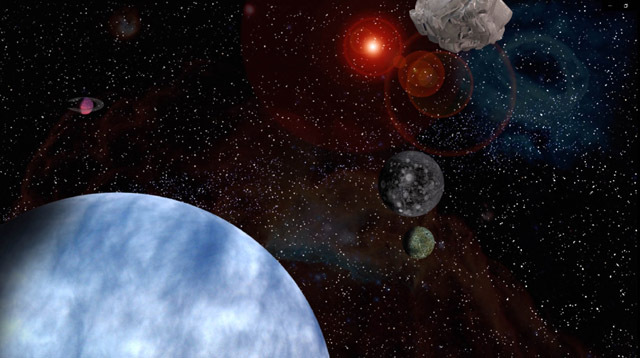 Does Pluto even exist or is it a fake too? 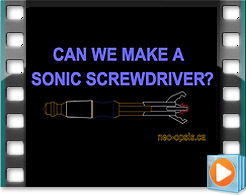 Can We Make A Sonic Screwdriver? 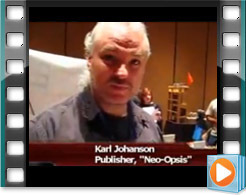 Karl Johanson, editor of Neo-opsis Science Fiction Magazine discusses the question of whether mankind now has the technology to make a "sonic screwdriver" like The Doctor from Dr. Who uses. Steph The Video Guy has done a series of Author Ambush interviews, This is his interview of Neo-opsis’ editor, done at the 2008 World Fantasy Convention in Calgary, AB. Panel at GottaCon 2013, Victoria BC. 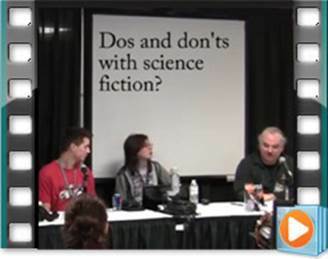 This panel was presented at the gaming con GottaCon 2013, in Victoria, BC. 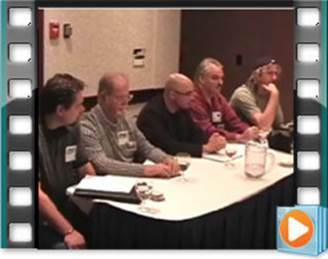 The panelists were: Jules Sherred (moderator), Alyx Dellamonica, Dave Duncan, Matt Hughes, T.J. Silver. 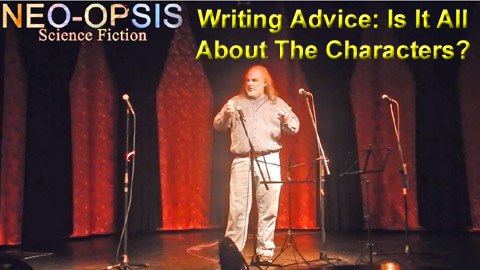 This panel included useful tips for writers on how to construct and sell stories. GottaCon: http://www.gottacon.com 2014 is Feb 7 - 9 2014, at Pearkes Arena, Victoria BC. Take Me to the Kaptin by Prism. 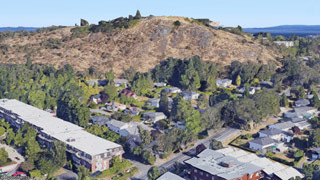 Vancouver, BC in 2012. Al Harlow (lead guitar, lead vocals), Gary Grace (drums, vocals), Tad Goddard (bass, vocals), Marc Gladstone (keyboard, vocals). This is an audience video of the concert, not an official Prism video, although I did ask Prism's permission to post this. "Take me to the Kaptin" was written by Jim Vallance (jimvalance.com), and was first released on Prism's album Prism, in 1977. Filmed by Karl Johanson, using a Canon HD CMOS, which manages decent sound quality & which occasionally pics up the sound of audience members commenting or singing along. Some robots on display at the 2006 Worldcon in LA. The robots from movies and TV series were by the Robot Man (www.the-robotman.com). C3PO & R2D2 (from Star Wars), Robby the Robot (from Forbidden Planet), Cylon (from the original Battlestar Galactica), Gort (from The Day the Earth Stood Still", Astro Boy, Dalek (from Dr Who), Gigantor and Drone # 2 "Huey" (from Silent Running). The Mars Exploration Rover robot was by the Jet Propulsion Lab. August 2005. 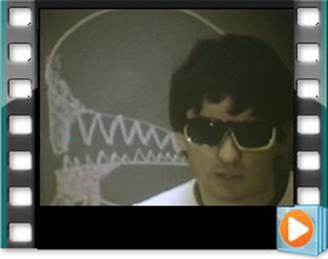 An 8 millimeter movie that Karl and his friend John Wright and I did in junior high school in 1978. I forget what type of plane the model was. We used a vacuum cleaner to blow air on the propeller to get it to spin while filming. 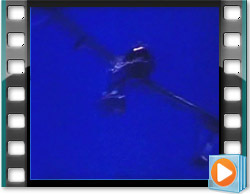 We ran out of film just as their aircraft was exploding on the ground, so we missed part of it. 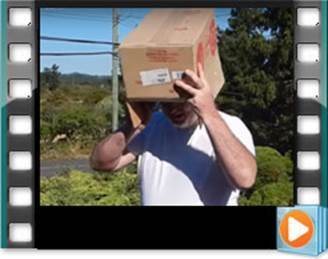 The explosion lit a bit of John's hair on fire as he was filming. The 'laser' was hand scratched onto the film. The film was run quite a few times, so there's lots of scratch marks & such on the film. 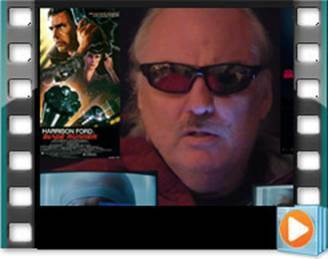 I had it transferred to DVD in 2009, which has added some MPEG compression artifacts. I added the sound in 2010. An animation I did of a Snake Puzzle Toy in (I think) 1981. (No sound) I recently had the Super 8 film converted to DVD. 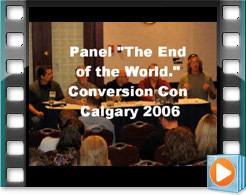 An excerpt from the panel "The End of the World," at Conversion Con 2006 in Calgary, Alberta. Panelists left to right: Jeff Krehmer, Larry Niven, William Gibson, Karl Johanson and Scott Barker. Another excerpt from the panel "The End of the World," at Conversion Con 2006 in Calgary, Alberta. This section is about the political reactions that might happen if we found out a large meteor was going to hit the Earth. Panelists left to right: Jeff Krehmer, Larry Niven, William Gibson, Karl Johanson and Scott Barker. 2009 Aurora Award Ceremony www.prix-aurora-awards.ca. 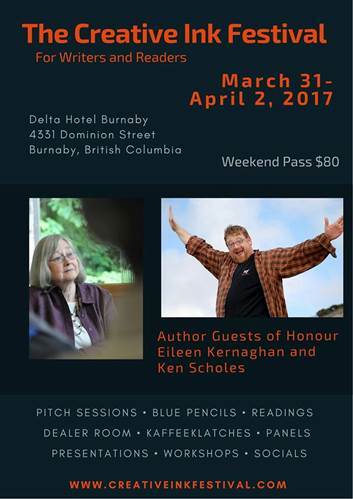 The Auroras Awards is a Canadian 'people's choice' award for work in fantasy and science fiction. Part of Worldcon 2009 in Montreal. Presentation of the award by Donna Mei-Ling Park. 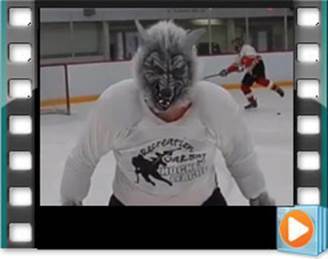 Winner: Ringing in the Changes in Okotoks, Alberta, Randy McCharles. -"A Bouquet of Flowers in a Vase by Van Gogh" Douglas Smith. 2009 Aurora Award Ceremony www.prix-aurora-awards.ca. The Auroras are a Canadian 'people's choice' award for works of fantasy or science fiction. Part of Worldcon 2009 in Montreal. Presentation of the award: Amy J. Ransom. -"Ballade sur Pallide" Michèle Laframboise. -"La révolte des gilets-malins" Michèle Laframboise. -"Jos Montferrand et le Grand Brigand des routes"
2009 Aurora Award Ceremony www.prix-aurora-awards.ca. 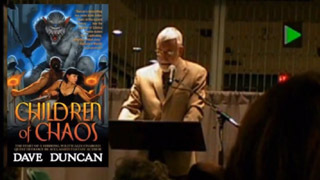 The Auroras Awards are Canadian 'people's choice' awards for work in fantasy and science fiction. Part of Worldcon 2009 in Montreal. Presentation of the award "Best Work in English: Other" by Julie Czerneda. 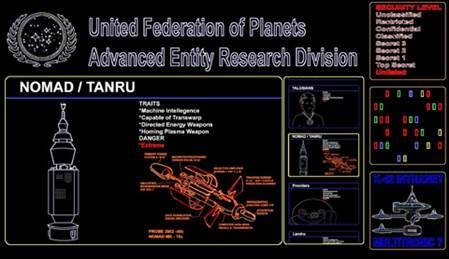 Winner: Neo-opsis Science Fiction Magazine, Karl Johanson, Ed. -The Gaslight Grimoire, Jeff Campbell & Charles Prepolec, Réd. -Tesseracts Twelve, Claude Lalumière, Ed. 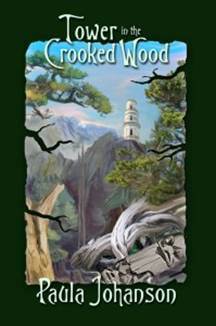 -Through The Window: A Journey To The Borderlands. -Of Faerie, Marcie Lynn Tentchoff. -On Spec magazine, Diane Walton, Ed. Presentation of the award by Ed the Sock. -After the Fires, Ursula Pflug. -Identity Theft and Other Stories, Robert J. Sawyer. I thought that the budgie chick would enjoy an assisted flight, as its wings aren't developed enough for it to fly on its own. (23 days old.) I added a soundtrack to give it a bit of an SF feel. A walk around video at Gottacon, a gaming convention at Pearkes Arena in Victoria BC. This is Friday night, Feb 5, 2010. 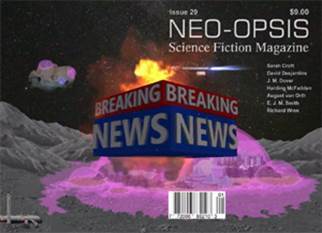 We had a dealers table for Neo-opsis Science Fiction Magazine, for the con. I did the walk around during a lull in the dealer room traffic. The light level went up & down on the camera a bit for some reason, possibly low batteries. 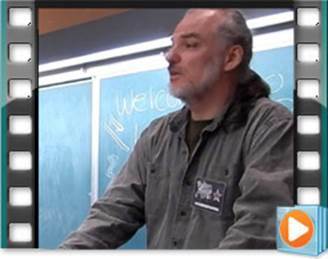 This is video is an excerpt from the panel "Spaceships on the Cheap." Conversion Con 2006. Calgary, Alberta. 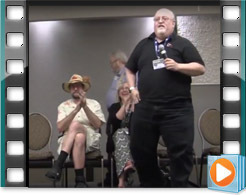 Left to right, Karl Johanson, unknown, Blair Peterson, Larry Niven and unknown. 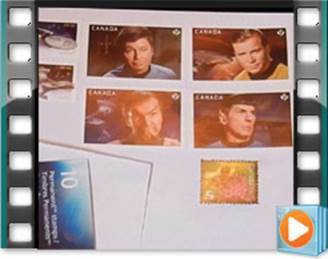 The idea is to use alpha particles to propel a thin sheet of paper in space. My friend Phillip Freeman did a back of the envelope calculation, suggesting that the alpha particles could get the paper to solar escape velocity within one half life of the alpha emitting isotope. 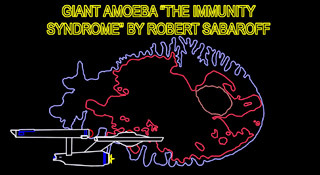 More details of this idea are in an article in issue 16 of Neo-opsis Science Fiction Magazine. Lego animation of some classic video games filmed with a digital camera in 2004. Lego and clay animation by Karl and Stephanie Johanson in 1989. Background art by Stephanie Johanson. 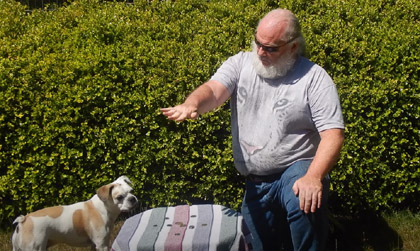 The music was recorded in 1976 by John Wright (now of "No Means No") and I, using a monophonic Moog synthesizer to back up our echo augmented singing. I had the film transferred to DVD in 2009, then converted it to mpg and added sound. There are some light level issues due to the quality of the film camera and the age of the film. 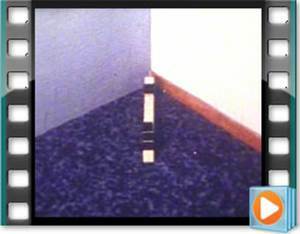 Some Super 8 animation I did on the floor of my parent's basement some years ago. Transferred to DVD in 2009. 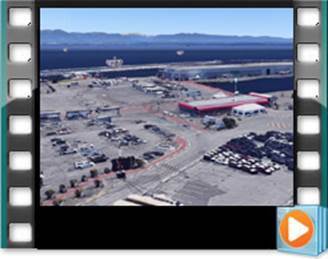 Converted to WMV and sound added in 2010. A very unusual structure found on the beach at Florencia Bay, Pacific Rim National Park, BC, Canada. In this mini mini documentary, Karl Johanson discusses the most plausible theory of this structure's origin. 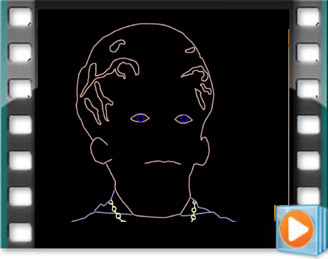 Graphics produced using Photoshop 7 and AVI Constructor. Really Short Science Fiction: Can I Borrow Your Time Machine? 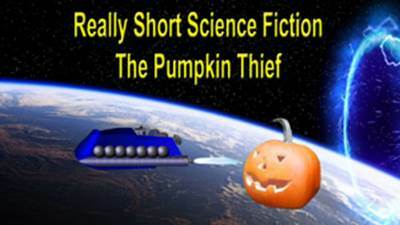 Just like the title says, some really short science fiction. In this episode we see a couple enjoying the cuisine of a lunar restaurant at the crater Tycho. An excerpt from the panel discussion, "Our Green Future Doesn't Have to be Soylent." VCon 35, Vancouver BC, October 1 - 3, 2010. Vancouver Airport Marriott Hotel. Panelists (left to right), writer Donna McMahon, Neo-opsis Science Fiction Magazine editor Karl Johanson and writer Paula Johanson. The novel "Make Room Make Room" by Harry Harrison was published in 1966. The movie "Soylent Green" was released in 1973. 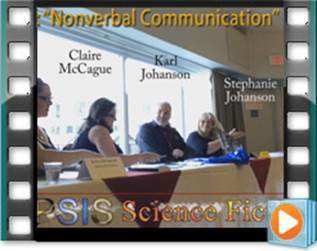 This excerpt from the panel was filmed by Stephanie Ann Johanson, using an Olympus Stylus Tough 300, with audio from the on board microphone. I was a moment late for the panel, so someone put a drawing of me on the whiteboard behind us, as I rushed from a previous panel.